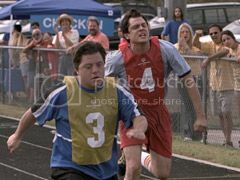 I saw a preview of The Ringer, in which Johnny Knoxville pretends to be mentally disabled in order to win some sort of special olympics. There are the occasionaly funny moments, but Johnny Knoxville is just very bad at acting mentally disabled and seems to think the way to do it is to act like the house elf from Harry Potter. A lot of it made me feel very uncomfortable, and I think in the end it was only pretending to have its heart in the right place.